Hannum’s Harley-Davidson understands that there are obstacles or questions you may have when you are looking to purchase a new motorcycle. Why Harley? How do I start? How can I afford this? So, we’ve come up with a list of answers that we think will help to answer some of those questions. Q: Why should I purchase a Harley-Davidson® motorcycle instead of a different brand? A: Harley-Davidson® has established themselves as the premier manufacturer’s of quality motorcycles. Their styling, performance, and distinctive sound are both desired, and emulated the world over. Harley-Davidson® Motor Company has built a reputation for making some of the most powerful, reliable, technically advanced, and distinctive motorcycles on the road. Harley-Davidson® Motor Company has been in business for over 100 years, and in 2002 was named Forbes Magazine’s “Company of the Year”. Harley-Davidson® is a company that has survived many turbulent economic times. You can purchase a motorcycle from this company with confidence that their legacy will continue for many years to come. There are literally thousands of parts and accessories that exist to customize your Harley-Davidson® motorcycle giving you an unique opportunity to create a unique expression of yourself. While other motorcycle company have lately recognized the importance of offering custom parts and accessories for their motorcycles, no other brand comes close to offering the variety or quality of Genuine Harley-Davidson® products. Harley-Davidson® motorcycles are more than just machines, they are the soul of the motorcycling world. No other brand elicits the same enthusiasm and awe from owners or bystanders. Still not 100% convinced? Visit Harley-Davidson® to find out what makes a motorcycle true and right for you! Q: What is the purchase price of a new Harley-Davidson® bike? A: Hannum’s sells all of our new units for Manufacturer’s Suggested Retail Pricing plus freight and setup, taxes, and tags. M.S.R.P. can be found at www.harley-davidson.com. 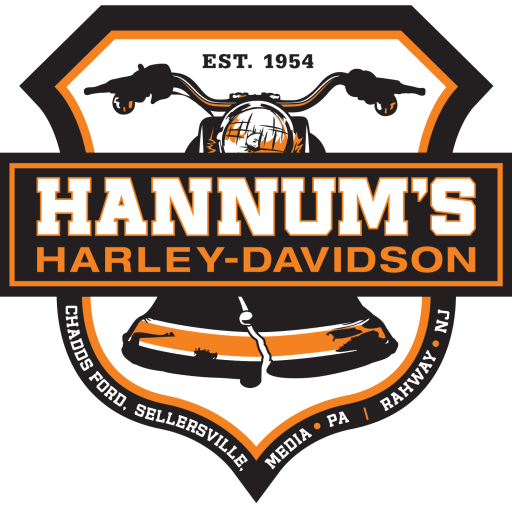 Q: What payment options do I have when purchasing my Harley® through Hannum’s? A: Hannum’s accepts cash and financing is available through Harley-Davidson® Financial Services as well as a few other financial outlets. Your interest rate depends on the current economy and your credit score. Harley-Davidson Credit offers a range of different financing options to suit your needs. Fill out an on-line application today by clicking here. Q: Do you take trade-in’s? A: Yes, we do take almost any trades as long as they have a VIN and a motor. Value is based on current NADA and Blackbook values. You must bring in your trade for us to view before we can give you an accurate number. Remember, you do not pay tax on the amount of the trade-in. Q: What changes are going to be implemented for the coming model year? A: Harley-Davidson® Motor Co. does not typically announce what changes will be implemented until one or two months prior to the start of the model year which usually occurs at the end of July. Q: Does my new Harley-Davidson® come with a warranty? A: Yes, it comes with a two-year, bumper-to-bumper, unlimited mileage warranty. Q: How can I purchase an extended warranty? A: You can purchase up to 5 additional years of full coverage, unlimited miles, directly from Hannum’s. Extended warranties can also be purchased on pre-owned motorcycles with less than 50,000 miles or less than 10 years old. For specifics on extended warranty coverage and pricing, please call the Sales Department. Q: How much will insurance be? A: You will need to contact your insurance company to find out specific rates based on your situation. However, as a rule, the smaller the engine size, the cheaper the rate. Our Sales Dept will be happy to help you in obtaining insurance. Q: Do rider safety course help with obtaining my motorcycle license and insurance? A: Yes, the DMV in PA offers special classes that help you to understand the “Do’s and Dont’s” of motorcycling as well as practical riding classes. After completion, you receive your motorcycle license and typically will qualify for a discounted insurance rate. For more details talk with our Sales Department or contact the DMV. Q: When is my first service? A: The first scheduled service is at 1000 miles. The second service is necessary at 5000 miles, a third at 10,000 miles, and every 5000 miles thereafter. Hannum’s has a variety of economical service packages that can be purchased and financed into your new motorcycle deal or obtained at a later time. Talk with our Sales Department or Service Team about specifics. Q: Can I use other brands of oil in my Harley®? A: Harley-Davidson® strongly recommends that customers only use Harley-Davidson® oil which is specifically formulated to run at temperature of your Harley bike. Other oils may break down too fast or cause excess wear to motor parts. Q: Should I read my owners manual? A: Yes, the manual should answer any questions you might have about your motorcycle. Also, it is important to keep track of your dealer-performed services in the back of the manual to ensure the validity of the warranty.